I’m back online, spending August writing in the Arizona desert. It has been a month of flash rainstorms, hail and 110-degree days. I’m working in coffee shops, at restaurants and at my parents’ kitchen table. There have been distractions in the form of my siblings, an escaped tortoise named Bob Marley and the entire Harry Potter series, which I’m rereading for the first time since the last book came out. However, I am happy to report that I’ve gotten some work done, too. Today, I finished the second draft of Seaswept, the sequel to my forthcoming post-apocalyptic novel Seabound. This has been a major rewrite. The first draft of Seaswept was both rough and short. I had a lot of fun fleshing out the characters and action scenes (there are many), and I’m looking forward to digging into the next draft already. Next on the agenda, though, will be the final revision of Seabound, which I hope to finish when I get back to Hong Kong in September. 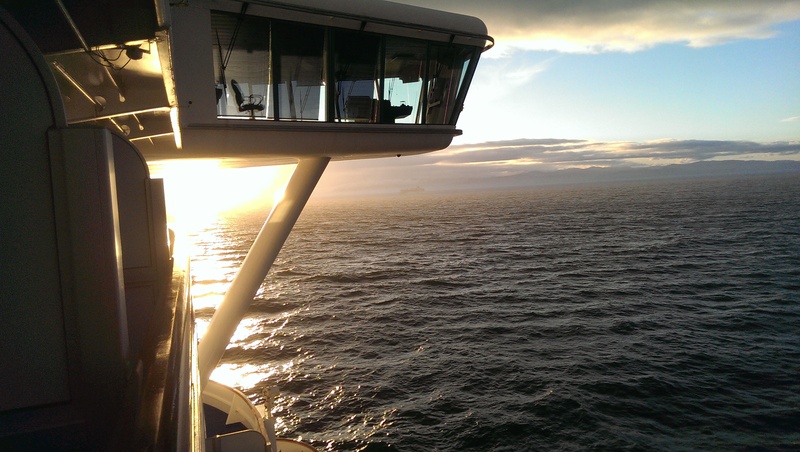 The cruise was an invaluable source of inspiration (not to mention ship photos!). I’ll write and post more about that soon. If you were on my mailing list last month, you’ll have already seen the cool cover I got for Seabound from James at GoOnWrite.com. I’ll send it again for new subscribers if you’d like to join up! You’ll also get advance notice of the super secret $0.99 sale when the book launches. Thanks, guys!